It never takes me long to settle in to a daily routine. I am a creature of habit! The hotel I’m staying at here in Thessaloniki is the only one I’m staying in which doesn’t provide breakfast; so for the last two mornings I’ve gone to Starbucks. There is one opposite my hotel; there is one in Aristotelous Sq. and there is one by the White Tower. I am using the one by the White Tower. Hot chocolate and a cheese/ham roll for breakfast, while I sit in an air conditioned room with a view of the sea. I am making the most of the air conditioning – my hotel room doesn’t have air con! Here, I get free wifi (the username and password printed on my reciept, along with the door code for the loos). The wifi here is much better than the wifi in the hotel. The great thing about this country is that it is perfectly acceptable, considered normal even, to buy a drink, take 5-10 minutes to drink it, and then still be sitting down an hour later, surfing the net. There’s no need to rush about in this country: it’s too hot for that! I can also charge my laptop here: there’s only one socket in my hotel room, and I’m using that for the fan. I had lunch yesterday at the Goody’s restaurant too; sitting upstairs there is a brilliant sea view – and there’s free wifi there too; I just follow the instructions (all in Greek) to log in: basically, I type in my Greek mobile number, and it sends me an access code, which is valid for a year. Again, no need to rush there either. 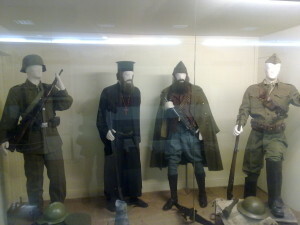 Yesterday morning I went to the Thessaloniki War Museum (Πολεμικό Μουσείο Θεσσαλονίκης). I’d read about it on the Internet and thought it looked interesting. It took me a while to find it: it was further away than I thought, and wasn’t particularly well signed. But I found it in the end. Interesting, it certainly was! When I walked in the entrance, the army officer running it greeted me, and we chatted in Greek for a few minutes, as he asked me how I’d heard about the museum (my response: «Διάβασα στο Ίντερνετ, στο Trip Advisor»); he asked me how I know Greek and about my studies at university, and then told me a bit about the museum, and the best route to take through the museum. The entrance fee is €3, or €1,50 for students at Greek universities. I learned quite a lot about the recent history of Greece; the 1821 revolution, the Balkan Wars, and about Greece’s involvement in the Α’ Παγκόσμικο Πόλεμο and the Β’ Παγκόσμικο Πόλεμο (WW1 and WW2). Some items were only labelled in Greek; I took quite a lot of photos of these labels, and was then able to consult Google after returning to my hotel room, to find out what they meant. 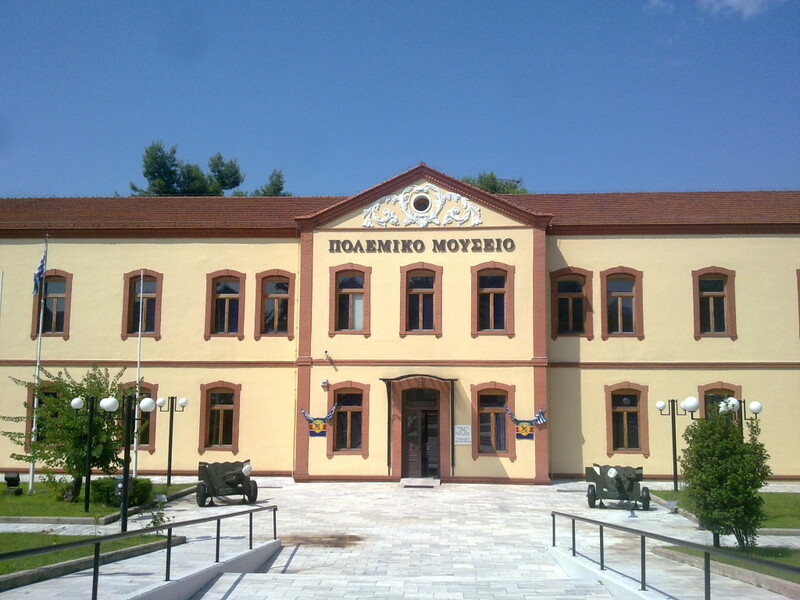 The museum is also home to one of the largest collections of Greek army medals on public display in Greece: medals from as recently as the 1980s, going back to the 1820s. Throughout the time I was in the museum, there was not another visitor in sight: I think I must have been the only visitor there – this surprised me, given the number of reviews on Trip Advisor saying how great it was. I managed to pick up quite a few leaflets before I left the War Museum, giving me some ideas of other things to do in Thessaloniki. The White Tower I need to do at some point, but it’s only open for a limited time each day, and not on Mondays – so tomorrow will be my only opportunity, as I’m off to meet my family at the Airport on Wednesday. After lunch at Goody’s, I headed back to my hotel room. I had only intended to pick up my city map and leave my leaflets in the room… but I sat down for a couple of minutes and ended up sleeping for almost 5 hours, waking up just before 8pm. Clearly, all the walking I’d done in the morning had tired me out. That is the main difference between Athens and Thessaloniki: In Athens, the Underground was a very convenient and cheap way of travelling the city; in Thessaloniki there are only busses, and I’ve not used any of them yet, I’ve preferred exploring on foot. That said, there are roadworks all over the city: the Underground network for Thessaloniki is now under construction. The disadvantage of walking around by foot is that I haven’t got a clue which district I’m in/where I am on the map. No train announcements or stations to tell me where I am! In the evening, after doing a Google search for places to go and eat in Thessaloniki (the bars along the sea front didn’t really appeal to me much, I wanted the more traditional tavernas), I headed for Navarinous Square (Πλατεία Ναυαρίνου), where there was a taverna which good reviews online. The Liopesi restaurant (Εστιατόριο Λιόπεσι) was the one I was heading for and I was not disappointed. He had his menu on the wall outside – only in Greek. This prompted the waiter to ask me «Ελληνάς είσαι;» (“You are Greek?”) Another opportunity for me to explain that I learn Greek in the UK… and about my travels in Greece. It is a conversation I am having on a daily basis, but my script changes as each day passes. More and more of what I have done goes in to the past tense, and I use the future tense less and less. When talking about what I do in England, I hate that my life at university is all now entirely in the past tense: «Φοιτητής ήμουνα. Σπούδασα το ραδιόφωνο στο πανεπιστήμιο στην Αγγλία, και τελείωσα τις σπουδές μου 6 εβδομάδες πριν. Θέλω να γίνω δημοσιογράφος». If they are impressed that I can speak Greek at all, they are usually even more impressed that I know the Greek word for ‘journalist’ or ‘radio producer’. Unlike English people, the Greeks are genuinely surprised, and pleased, to find foreigners able to speak their language, even more so to find a foreigner able to read their alphabet: It is a brilliant conversation starter, and my ability to speak in their own language often results in me being treated as a friend, rather than as ‘just another English tourist’. 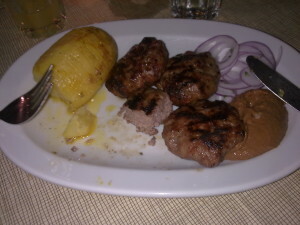 The meal I enjoyed at the Liopesi was κεφτεδάκι (meatballs) – his signature dish… «Το σπεσιάλ μας είναι». Served with potatoes, and some onion on the side. Plus a drink (Fanta orange), a bottle of water, and some bread… cost €10,50. The meatballs really were very tasty. Aware that I have been sitting here now for almost 2 hours, I’m off to find something to do for the day. I’m going to the ticket office to buy a 24 hour bus pass, then I’m going to see if I can get to visit Radio Thessaloniki; I e-mailed them a few weeks back and they have said they’d love me to visit. So my challenge for today is to get the right bus to there. I think it’s in the Thermi direction. There has also been talk of maybe meeting up with my Greek friend Rafael who lives in the city, but he’s only around for a short while as he’s off abroad soon. If that is going to happen, today is really our only chance.